Why does time move so much faster the older you are. I heard a theory once that time moves slower for you the younger you are as you have the majority of your life ahead of you. Once you hit your mature years time moves quicker as you have the majority of your life behind you. Not sure how you really explain it but it seems just a couple months ago I was baking up something with peanut butter and chocolate for Rob’s 20th birthday. How is it possible another year has gone by. We are celebrating Rob’s birthday a week early so I guess I cannot bore you with all the details of his birth, saying I remember this happened today 21 years ago today, wishing someone would hit me over the head with a baseball bat to dull the labour pains whilst waiting for the epidural. But it was all worth it! And as I look at my bearded almost 21 year old it seems a lifetime ago. So today’s offering is yummy ice cream cake. The recipe is in pictures below. I used a spring form pan (whatever size you wish) and made a graham cracker crust with crumbs, melted butter and a little sugar. 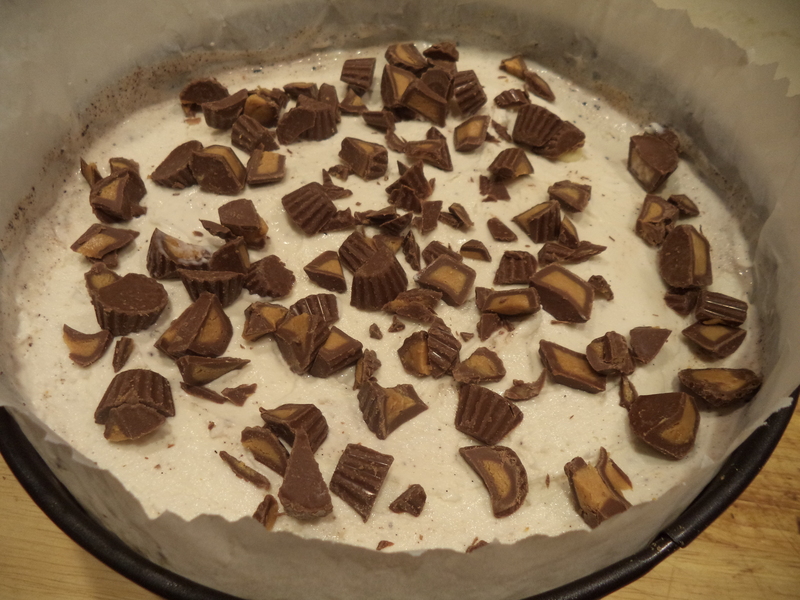 Baked it up and once cooled layered the 2 flavours of ice cream we like, some white chocolate chips and some rough chop peanut butter cups to top the cake. Wrap well with saran wrap and put back in the freezer. Voila! Easy and a lot less expensive than your store bought version. Use something round to pat down crumb crust. Ready to bake at 375F for about 10-12 minutes. Rose Bridal Shower Cake – Love is Like This! Looks awesome… Can’t wait to make it! Hi Chris, I can always count on you for positive feedback. Thank you.